A Day Late and A Dollar Short: **FREE** Ice Breakers Mints - Today Only! 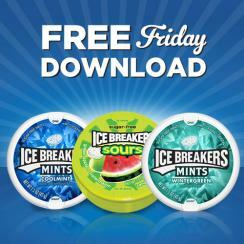 **FREE** Ice Breakers Mints - Today Only! Head on over to the Kroger promotions page website to download your digital coupon good for one (1) **FREE** Ice Breakers Mints! The coupon can only be downloaded today, but it is redeemable through October 25th.